"Fresh air" is not the same as 'Clean Air'! Healthy air is fresh and clean ! ventilated.When is ventilated naturally, ie by opening windows and vents,one is not aware of the air quality and it does not know when,how much and how long should be ventilated.If there is mechanical ventilation prove these systems are often poorly functioning and produce.Much noise nuisance In areas where relatively many people stay,such as schools,day care centers,meeting rooms,health care, sports and of course offices and homes,often lack sufficient fresh air due to poor ventilation. Ventilation is not only necessary to perform the necessary oxygen but also exhaled air,odors,moisture and pollutants to be discharged as radon,a radioactive gas that is released from concrete,brick,cement and plaster and solvents released from paint , carpeting, particleboard and cleaning,also called volatile organic compounds ( called).Volatile organic compounds are a combination of hydrocarbons which are easy to evaporate. 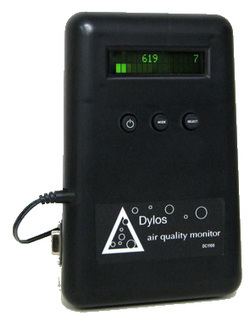 'CO2' is the indicator of air quality in schools, nurseries, offices and homes! exhalation air, the produced CO2 is removed from the body. If you stay in a room that is not or no ventilation, the CO2 levels rise considerably in space. Besides exhale CO2 every person gives off all fragrances.The amount of CO2 which is produced by a human body is more or less parallel to the amount of odor substances which shall be issued.CO2 is therefore seen as a good indicator of air quality in areas where people are the main sources of pollution.The CO2 concentration is expressed in parts per million (ppm), and indicates the number of parts per million of CO2-air particles. The CO2 concentration of the air is on most of locations in the Netherlands about 400 ppm.The exposure limit is reached when the CO2 concentration has risen to 1,200 ppm.Then, the oxygen concentration is still well above the required 20.9%.This is the reason that advanced ventilation always CO2-driven. The optimum temperature for brain activity is 20-22 ° C. From 26 ° C, the comfort, and the efficiency is less. In winter, it is important not to come. At lower temperatures,moisture namely easier precipitate on windows or walls and ceilings draw, allowing moisture or mildew could occur.The temperature can best be controlled by a central thermostat or thermostatic valves on all radiators. The relative humidity indicates the extent to which the air is saturated with moisture.The relative humidity should be. Between 30% and 70%. Low humidity is not a problem, but in combination with dustiness cause irritation of the mucous membranes of eyes, nose and throat. Some people use devices that bring moisture in the air, but most complaints of dry air coming through too much dust in the air and not by the moisture content. Clean, dry air rarely shows symptoms. With a feeling of dry eyes is better to ventilate properly and keep them clean. Space (dust).Too high humidity is rare in schools, nurseries and offices.Moisture problems can occur in homes due to a damp crawl space, moisture leakage and rain penetration. When the humidity is chronically high, mold and dust mites can develop better.This can lead to (worsening) respiratory symptoms,especially in people with sensitive airways.Moisture problems are prevented by sufficient and thus consciously to vent! We talk about fresh air as CO2 levels below 1,000 ppm. Clean air means that the air is free of (harmful) particles, such as fine dust, bacteria, pollen,smoke,etc.Fresh air is not necessarily clean, and clean air is not necessarily fresh! The outdoor air quality also determines how clean the air is inside.If you are in an area where desired, the outside air quality is wise addition to the CO2 concentration also to monitor. Sometimes it is better to keep the windows closed .. whether it is advisable to place. an air purifier the Particulates consist of particles suspended in the air particles which are smaller than 10 micrometers (= 1 hundredth of a millimeter). Particulate matter consists of particles of different size, origin and chemical composition.